Arthur A. Levine Books, 9781338216660, 336pp. While Harry grapples with a past that refuses to stay where it belongs, his youngest son, Albus, must struggle with the weight of a family legacy he never wanted. As past and present fuse ominously, both father and son learn the uncomfortable truth: Sometimes, darkness comes from unexpected places. The playscript for Harry Potter and the Cursed Child was originally released as a "special rehearsal edition" alongside the opening of Jack Thorne’s play in London’s West End in summer 2016. 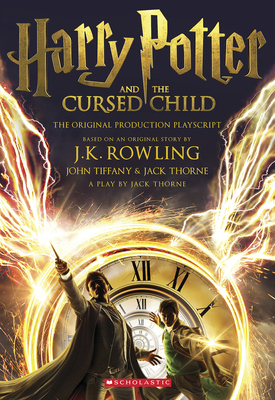 Based on an original story by J.K. Rowling, John Tiffany, and Jack Thorne, the play opened to rapturous reviews from theatergoers and critics alike, while the official playscript became an immediate global bestseller. Jack Thorne writes for theater, film, television, and radio. His theater credits include Hope and Let the Right One In, both directed by John Tiffany, Junkyard, a Headlong, Rose Theatre Kingston, Bristol Old Vic & Theatr Clwyd co-production, The Solid Life of Sugarwater for the Graeae Theatre Company, Bunny for the Edinburgh Fringe Festival, Stacy for the Trafalgar Studios, 2nd May 1997 and When You Cure Me for the Bush. His adaptations include The Physicists for the Donmar Warehouse and Stuart: A Life Backwards for Hightide. On film his credits include War Book, A Long Way Down, and The Scouting Book for Boys. For television his credits include The Last Panthers, Don't Take My Baby, This Is England, The Fades, Glue, Cast-Offs, and National Treasure. He won BAFTAs in 2016 for Best Mini-Series (This Is England '90) and Best Single Drama (Don't Take My Baby), and in 2012 for Best Drama Series (The Fades) and Best Mini-Series(This Is England '88). John Tiffany directed Once for which he was the recipient of multiple awards on Broadway, in the West End, and internationally. Other recent credits include The Glass Menagerie at A.R.T. and on Broadway, EIF, and the West End, and The Ambassador at BAM. As Associate Director of the Royal Court, his work includes The Twits, Hope, and The Pass. He was the director of Let the Right One In for the National Theatre of Scotland, which transferred to the Royal Court, West End, St. Ann's Warehouse, and toured internationally. His other work for the National Theatre of Scotland includes Macbeth (also Lincoln Center and Broadway), Enquirer, The Missing, Peter Pan, The House of Bernarda Alba, Transform Caithness: Hunter, Be Near Me, Nobody Will Ever Forgive Us, The Bacchae (also Lincoln Center), Elizabeth Gordon Quinn, Home: Glasgow, and Black Watch, which toured internationally and for which he won the Olivier and Critics' Circle awards. He was Associate Director of the Traverse Theatre from 1996 to 2001, Paines Plough from 2001 to 2005, the National Theatre of Scotland from 2005 to 2012, and was a Radcliffe Fellow at Harvard University in the 2010-2011 academic year.